The first Swimrun The Riviera will take place on April 30 2017 and starts at Castell beach in Nice. The finish line will be at a stunning “Belle Epoque” villa in Cap d’Ail. The total Swimrun The Riviera race distance is 26km with a total of 5.8km swimming and 20.2km running. Swimming in open water is tough and a lot more difficult than tralala recreational swimming. We have seen people train for this race, splashing through the Med with maximum speed. Impressive! Besides swimming, competitors will have to run fast too, mostly on coastal paths. The start of Swimrun the Riviera will be in the sea as a swim portion and the last portion will be a run so competitors will run across the finish line. There will be 15 transitions in total, 8 swim portions varying between 400m-1000m and 8 run portions of varying between 800m-6000m. The race is divided into 3 main sections with 2 refreshment stations. The 1st refreshment station will be at the Passable Beach in Saint-Jean-Cap-Ferrat and the 2nd refreshment station will be at the Petite Afrique beach in Beaulieu sur Mer. 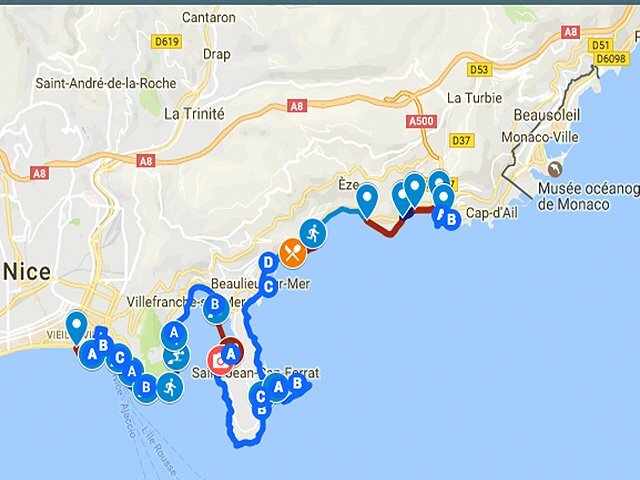 Download a detailed course map of the Swimrun The Riviera 2017 on the Swimrun website. The swim portions are in red and the run portions are in blue. The yellow points represent the beginning of a swim portion or « Drop Zone » and the orange points are the « Exit Zones ». Each team will receive a Road.